QuickSearch is Gumberg Library’s new online catalog and includes a mixture of holdings from Gumberg Library, Duquesne Center for Legal Information, and the Allegheny County Law Library. CatalogPlus allows you to search the library’s extensive electronic resources collection as well as print holdings. Searching Catalog limits your search only to the library’s physical collection. The Advanced Search provides additional options to limit your searches using Boolean search logic (AND, OR, and NOT). If you find that your results list includes too many results, there are several facets located on the left hand side of the screen to help narrow down your results. 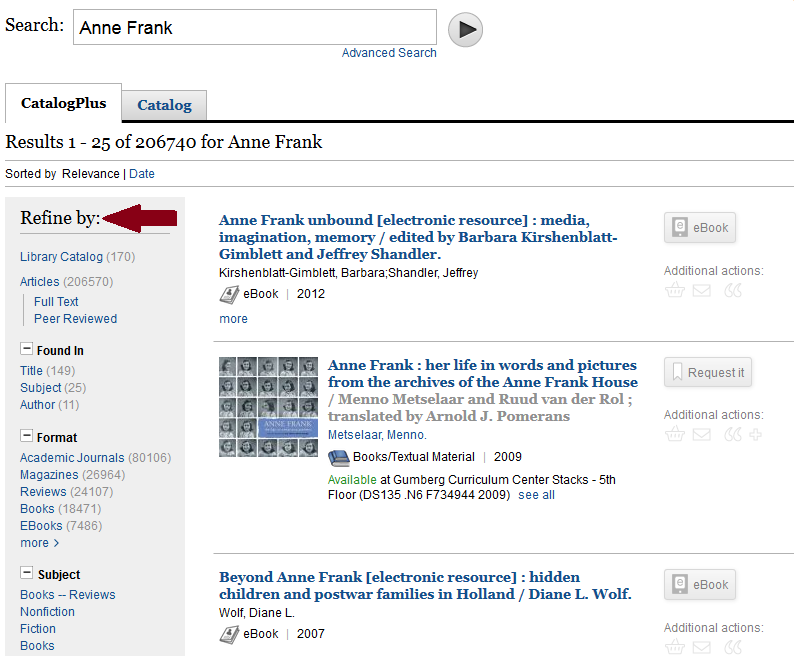 You can refine your search by: format, subject, collection, language, publisher, journal, publish date, and more. Also provided are related searches, including established search terms and additional suggestions. If you prefer a more traditional catalog, visit the Classic Catalog interface to search the library’s print holdings. If you need any assistance finding resources, please Ask-A-Librarian.